The main function of fertilization is to combine the haploid sets of chromosomes from two individuals into a single diploid cell, the zygote. In addition, fertilization activates the egg. Egg activation blocks entry by additional sperm, stimulates the final meiotic division, and triggers the onset of embryonic development. How does the sperm head enter the egg? What happens when an egg gets fertilized by two sperm: Animation. Note: Polyspermy is a significant problem for in vitro fertilization of humans (IVF). The polyspermy rate in IVF is about 10%. Polyspermy is prevented by: modest sperm number; Fast block; Slow block. The acrosome is the tip of the sperm head. The acrosomal reaction is a change in the sperm that is common to many animals. Its function is best understood in the sea urchin. The animation shown at the right is courtesy of Dr. David Epel at Stanford University's Hopkins Marine Station, by way of the Sea Urchin Embryology Tutorial. (1) Receptor proteins (red) in the sperm plasma membrane contact the sea urchin jelly coat (vitelline layer). This contact between receptor proteins and the jelly coat (vitelline layer) causes the acrosomal membrane to dissolve, releasing acrosomal enzymes. (2) In the egg, Na+ channels open in the plasma membrane (BELOW the jelly coat/vitelline layer.) Normally, Na+ concentration is higher outside the cell than inside. So Na+ ions flow down their gradient into the egg and the plasma membrane depolarizes (positive charges neutralize the more negative charge inside the egg cytoplasm.) This depolarization causes the FAST BLOCK TO POLYSPERMY. (3) The depolarization (neutralization of charge difference) causes voltage-sensitive Ca2+ channels to open in the egg endoplasmic reticulum (ER). (4) Digestive enzymes from the acrosomal vesicle (green) digest the jelly coat and vitelline membrane. Ca2+ also activates a Na+:H+ ion exchanger, which pumps H+ out of the cell, increasing intracellular pH. This pH change causes the polymerization of actin subunits (pink) into microfilament cables that thrust acrosomal processes toward the egg plasma membrane. Bindin (blue) released from the acrosomal vesicle coats the acrosomal process. (5) The increase in intracellular calcium causes water to enter the cell, increasing hydrostatic pressure. This aids in the extension of the acrosomal process. At last the acrosome fuses with the egg's plasma membrane (BENEATH the vitelline layer). The sperm head now has access to the cytoplasm. (6) The Ca2+ moves in a wave across the cell. This Ca++ results in the fusion of cortical vesicles with the egg plasma membrane, releasing their contents into the space surrounding the egg, called the perivitelline space. This raises the vitelline membrane, and inactivates bindin receptors on the vitelline membrane. Thus, any additional sperm are released from the vitelline membrane and no more bind. This is known as the SLOW BLOCK TO POLYSPERMY. (7) The sperm head now enters the cytoplasm, where it forms a male pronucleus. The pronucleus fuses with the egg nucleus, regenerating 2N chromosomes. Mitosis (first cleavage) then occurs. Fertilization is complete. After making its way through the jelly coat, the sperm makes contact with the vitelline envelope. Species-specific bindin receptors on the vitelline envelope are only able to recognize bindin molecules from the same species. This "lock and key" mechanism ensures that eggs are fertilized only by sperm of the same species. After making its way through the vitteline envelope, the sperm and egg plasma membranes fuse, and the sperm nucleus enters the cytoplasm of the egg. Although many sperm attach to the coats surrounding the egg, it is important that only one sperm fuses with the egg plasma membrane and delivers its nucleus into the egg. Two mechanisms are used by animals to ensure that only one sperm fertilizes a given egg: the fast block to polyspermy and the slow block to polyspermy. In marine invertebrates, including the sea urchin, a fast block to polyspermy occurs within a tenth of a second of fusion. The fast block to polyspermy involves the opening of Na+ channels in the egg plasma membrane. Na+ flows into the egg cell, depolarizing the membrane. This depolarization prevents additional sperm from fusing to the egg plasma membrane. The egg plasma membrane is restored to its normal -70mV potential within minutes of fusion as the Na+ channels close, other + ions flow out of the cell, and Na+ is pumped out. If depolarization is prevented, polyspermy occurs - but how depolarization blocks polyspermy is not yet understood. The slow block to polyspermy begins within 10 seconds of fusion of the sperm and egg plasma membranes. A compound called inositol triphosphate (IP3) causes the release of Ca++ from intracellular stores in the egg endoplasmic reticulum. Ca++ is first released at the site of sperm entry, and during the next minute, a wave of free Ca++ passes through the egg. This Ca++ results in the fusion of cortical vesicles with the egg plasma membrane, releasing their contents into the space surrounding the egg, called the perivitelline space. This raises the vitelline membrane, and inactivates bindin receptors on the vitelline membrane. Thus, any additional sperm are released from the vitelline membrane and no more bind. Click on the image below to watch a movie showing the events involved in the slow block to polyspermy! This movie shows simultaneous double imaging of phase contrast (left) and intracellular Ca ++ concentration (right) during sea urchin fertilization. The left image shows the approach of the sperm at about 2 o'clock and the rising of the vitelline membrane. Intracellular Ca++ is monitored by an indicator that becomes more fluorescent when it binds Ca++. A transient Ca++ rise around the entire cortex (fifth frame) is followed by the Ca++ wave, which begins at the sperm entry site. What about Polyspermy in Mammals? A "fast" block acts at the "zona pellucida" (equivalent to the jelly coat or vitelline membrane). The molecular mechanisms are less well understood than those of sea urchins. The blocking is incomplete. In in vitro fertilization, the rate of polyspermy is as high as 10%. Ca++ release at fertilization results in an increase in metabolic activity within the egg, apparently due to an increase in the intracellular pH of the egg. Diacyl gycerol (DAG) causes protein phosphorylation cascades to be initiated, with one result being the phosphorylation and activation of a plasma membrane Na+:H+ ion exchanger. Na+ is pumped into the cell, H+ is pumped out of the cell, and the pH inside the cell increases. Sperm themselves are NOT required for egg activation - injection of Ca++ can artificially induce egg activation in many species. Positional information is already contained within many eggs, with the exception of mammals. Egg polarity is due to the asymmetric distribution of cytoplasmic molecules, including mRNAs, proteins, and yolk, and is roughly oriented along the anterior/posterior axis in most animals. A rearrangment of the egg cytoplasm is induced by fertilization, and this rearrangment (called cortical rotation) results in the establishment of the dorsal/ventral axis. During cortical rotation, the plasma membrane and cortex (cytoplasmic region just below the plasma membrane) rotate relative to the inner cytoplasm. The pigmentation of frog eggs makes it possible to observe this process visually, and results in a gray area, called the gray crescent. Click on this image to watch a schematic movie of cortical rotation, adapted from classic work by Schleip. The dense, yolky vegetal deep cytoplasm rotates with respect to the overlying cortex to produce a 30 degree relative rotation. Cortical rotation helps establish positional information by affecting the distribution of Cytoplasmic Determinants like b-catenin. Click here for details about how asymmetric distribution of b-catenin results from cortical rotation. Cleavage is a series of rapid cell divisions without cell growth or gene expression which occurs in early embryogenesis. 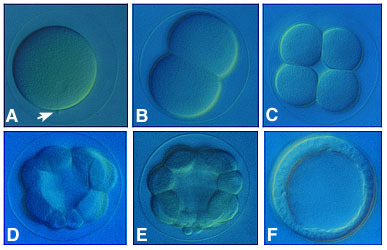 Early cleavage divisions in most embryos are reductive. During cleavage, the cytoplasm is divided into smaller and smaller cells, called blastomeres. The total cellular volume of the embryo stays the same, but the number of cells within the embryo increases. Cleaving cells have a modified cell cycle, in which the two gap phases, G1 and G2, are completely omitted. The cells cycle rapidly between M and S phases. Cleavage results in a blastula, a ball of cells with a central cavity called the blastocoel. 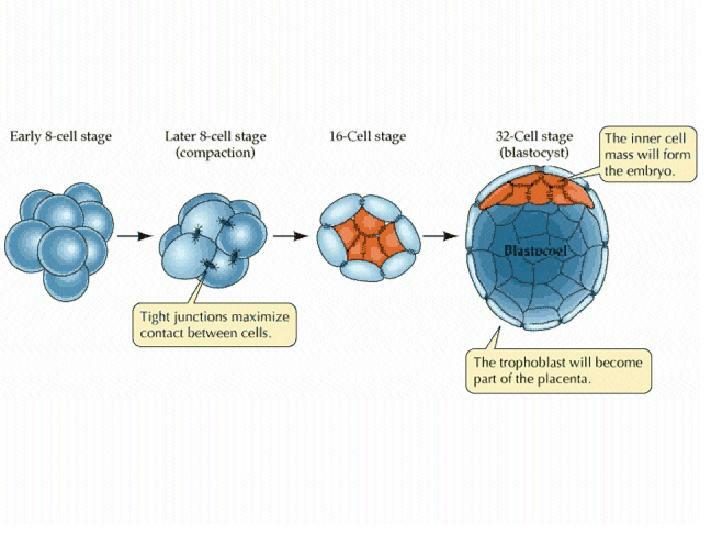 Below are two diagrams of blastulas. On the left is a sea urchin blastula, and on the right is a frog blastula. The pattern of cleavage is influenced by the amount of yolk in the egg. In eggs with less yolk, cleavages are equal, and the resulting blastomeres are of similar size (a). 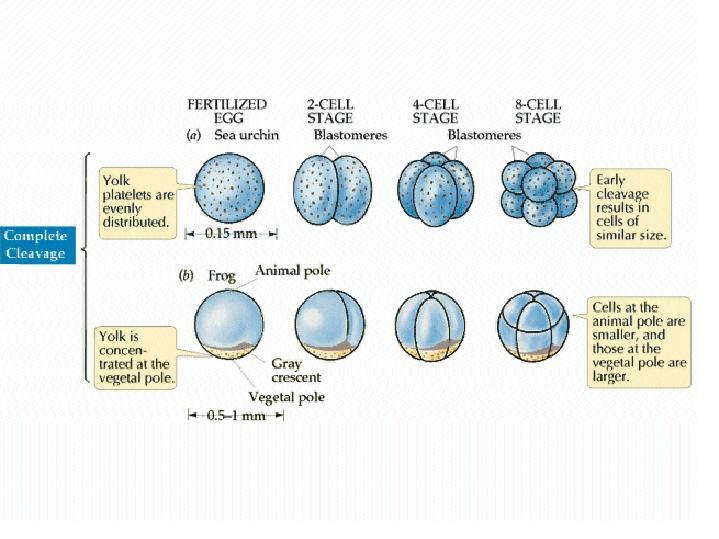 If the yolk is localized, such as in frog eggs, then cleavages are unequal - the cells derived from the yolky region (the vegetal pole) are larger than those derived from the region without yolk (the animal pole) (b). In the very yolky eggs of fish and birds, the cleavage furrow is slowed, or even blocked, by the presence of the yolk. 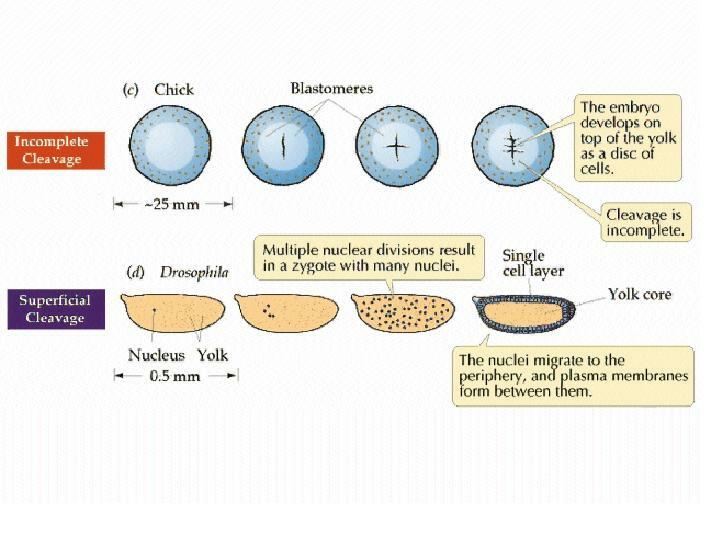 Complete divisions are restricted to the least yolky region of the egg, and the embryo forms as a cap of cells sitting on top of the yolk (c). See images of zebrafish cleavage below. Cleavage in the zebrafish embryo is limited to a small region on "top" of the yolky mass. Early cleavage patterns vary widely between different groups of animals, based largely on the orientation of the division planes. The simplest pattern is radial cleavage, in which successful division planes are at 90 degree angles relative to each other. This results in the blastomeres aligned directly over or to the side of one another. In spiral cleavage, the division planes are not at 90 degree angles, resulting in blastomeres that are NOT aligned directly over or beside one another. Click on the image below to get a better sense for the difference between these two cleavage patterns in two generalized embryos. Radial cleavage in the sea urchin results in a hollow sphere of cells. At the right are pictures of various cleavage stages in the sea urchin L. variegatus. A. 1-cell zygote. The fertilization envelope is visible as a large "halo" around the embryo. The arrow points to the site of sperm penetration. B. 2-cell. C. 8-cell. D. 16-cell. E. 32-cell. F. Hatched blastula (F is courtesy Dr. Chuck Ettensohn, Carnegie-Mellon Univ.). The mammalian zygote gives rise to both the embryo and extraembryonic tissues, such as the placenta. Changes in cell behavior and cell cleavage patterns during early embrogenesis results in a 32-cell blastocyst consisting of the inner cell mass, which will form the embryo, and the trophoblast, which will form extraembryonic tissues. Watch this animation of human development from University of Pennsylvania Health System Basic Embryology Review Program. Focus on the inital stages of development, up until implantation.